Another way of looking at it is: Ann and John Ware had a son named William Ware who married both his cousin Susannah by his Aunt Ann and Uncle Robert Payne & also his cousin Susannah by his Uncle William and Aunt Anna Payne Harrison. They were all cousins with Dolley Madison. 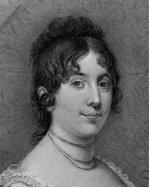 Judge Thomas Todd married Lucy (Payne) Washington, the widow of Major George Steptoe Washington, a nephew of President Washington, and the youngest sister of Dolly Madison. Their children were: William J., Madisonia, and James Madison. Todd died at his home near Frankfort, February 7, 1826, and was buried in the Innes family cemetery but later exhumed and reinterred in the State Cemetery at Frankfort. Justice Thomas Todd was a cousin of Judge Harry Innes who married Nancy Webb, the granddaughter of James and Catherine Todd Ware by their daughter Mary (Polly) Ware and her husband Charles Webb. Thompson Ware and Mary (Polly) Todd Ware Webb were both children of James and Caty Todd Ware. Thompson’s daughter, Sally Ware, had married Robert Spotswood Russell on May 29, 1827. His granddaughter was the bride, Mary W. Russell. Thompson’s sister, Polly Ware Webb, had a daughter named Nancy who had married Harry Innes. Polly’s grandson, Charles Webb Innes, was the groom. “In the years 1831-32, Henry Innes represented Kentucky in the state legislature. (Ref. 2201) His cousin, Thomas Todd, would later be named by President Thomas Jefferson as a Justice of the Supreme Court. # 2376 James Madison by: Ralph Ketcham, University of Virginia Press, Charlottesville and London, 1971 and revised 1990. For purposes of this paper, we are concentrating on the children highlighted in color. Robert Sr. PAYNE married Ann Burton & they had a daughter named Susannah who married William WARE after her cousin (Susannah Harrison Ware, his 1st wife)) died. John PAYNE married Mary Coles & had a daughter named Dolley Payne (Todd) Madison. Anna PAYNE born 27 Mar 1748 in Goochland Co., VA. married William HARRISON - brother of Ann Harrison WARE b. 29 Nov 1739, d. 1811, Pittsylvania Co., VA. Ann Harrison Ware was the wife of John Ware who was the son of James and Agnes Todd Ware. # 894. Harrison-Payne-Ware Part IV & V from Pittsylvania County, Virginia Heritage 1161-2004 Submitted by Betty Fitzgerald, Raleigh, North Carolina. Basically, Josias and Anne Fleming Payne had these 3 children - John, Anna, and Robert - - all Paynes. John married Mary Coles & had a daughter named Dolley Payne (Todd) Madison. Anna married William Harrison (brother of John Ware’s wife, Ann Harrison) & they had a daughter named Susannah Harrison who married William Ware (son of John & Ann Ware.) Robert married Ann Burton & they had a daughter also named Susannah and she also married William Ware after her cousin (Susannah Harrison Ware) died. 1. Frances Thompson Taylor, born August 30, 1700 at Hanover, King & Queen Co., Virginia. Married Ambrose Madison. 2. James Taylor III, born March 30, 1703 in Orange Co., Virginia. Married Alice Thornton; married Elizabeth McGrath. 3. Martha Taylor, born January 27, 1702. Married Col. Thomas Chew. 4. Zachary Taylor, born April 17, 1707 in Orange Co., Virginia. Married Elizabeth Lee. 5. George Taylor, born February 17, 1710 in Orange Co., Virginia. Married Rachael Gibson; married Sarah Taliaferro. 6. Tabitha Taylor, born March 2, 1713 in Orange Co., Virginia. Married Thomas Wild. 7. Erasmus Taylor, born September 5, 1715 in Orange Co., Virginia. Married Jane Moore. 8. Hannah Taylor, born March 15, 1718 in Orange Co., Virginia. Married Nicholas Battaile. 9. Mildred Taylor, born December 11, 1724 in Orange Co., Virginia. Married Richard Thomas. 10. Margaret Taylor, Married Edward Tinsley. The 3 children (in bold color print) of Col. James Taylor are the focus of this piece. Genealogies of Virginia Families, Vol. III, page 558. 2376. James Madison by: Ralph Ketcham, University of Virginia Press, Charlottesville and London, 1971 and revised 1990. Frances Thompson Taylor (daughter of Col. James Taylor II), born August 30, 1700 at Hanover, King & Queen Co., VA. Married Ambrose Madison, son of John Madison and Isabella Todd. According to James Madison by: Ralph Ketcham, University of Virginia Press, Charlottesville and London, 1971 and revised 1990. 1. James Madison Sr., born March 27, 1723 at Montpelier, Virginia. Married Eleanor Rose Conway. 1. President James Madison Jr., born March 6, 1751 in Port Conway, Caroline Co., Virginia. Married Dorothy (Dolley) Payne Todd Madison (May 20, 1768 – July 12, 1849) daughter of John Payne and Mary Coles, September 15, 1794 in Jefferson Co., Virginia. He died June 28, 1836 at Washington D.C. at age 85. President James Madison and his wife, Dolley, had no children of their own. They raised her son, Payne, from her first marriage to John Todd. The Sarah Madison (Mrs. Sarah Catlett (Madison) Macon) Family Bible printed by Thomas Baskett in London in 1759, contains records of the Madison, Conway, and Macon families. Recorded on its pages are the births and death of James Madison, fourth president of the United States. The Bible which once belonged to his sister, was deposited in the Virginia Historical Society jointly by Mrs. Conway Macon Knox and Mrs. Malcolm Bridges of Richmond, Virginia, 25 Mar 1954. If the Montpelier mansion is the heart of the museum property, the focal point of the celebration and interpretation of James Madison's life, then the Madison Family Cemetery must be regarded as the soul of the property. Within its walls lie the final resting places of not only the President, but all of his family, ancestors and descendants who called Montpelier home. 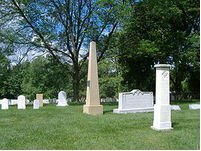 The seven earliest burials in the Madison Family Cemetery occurred between 1732 and 1775. All of these early graves were unmarked and were of family members directly related to President Madison: his grandfather Ambrose Madison; his grandmother, Frances Taylor Madison, who continued to reside at Mount Pleasant after her husband's death, and who died on November 25, 1761; and five siblings of James Madison, who died as infants or young children—a poignant reminder of the high mortality rate among children in the 18th century. The first of these infant children of James, Sr., and Nelly Conway Madison was Catlett Madison, born "Saturday 18th of March 1758 at 3 o'Clock in the morning. Aged 36 days." In the ensuing years an unnamed male infant, who was born and died on the same day sometime in 1766 and a stillborn child were added to the burials in the cemetery. The family Bible describes the stillborn event in stark terms: "Mrs. Madison Deliver'd of a Still born Child July 12th 1770." In the summer of 1775, the lives of Elizabeth (age 7) and Reuben (age 3) were cut short by a dysentry epidemic that swept through Orange County. 1. Zachary Taylor Jr., married Alice Chew, daughter of Col. Thomas Chew and Martha Taylor. 3. Colonel Richard Taylor, born April 12, 1741 in Orange Co., Virginia. Married Sarah Dabney Strother. 1. Richard Strother Taylor, born circa 1780. Hancock Taylor, born circa 1781; married Elizabeth Hoard. William Dabney Taylor, born 1782. Zachary Taylor, born November 24, 1784 in Orange Co., Virginia. Married Margaret Mackall Smith. George Taylor, born circa 1790. Elizabeth Lee Taylor, born 1792. President Zachary Taylor, born November 24, 1784 in Orange Co., Virginia. Married Margaret Mackall Smith. President Taylor (12th President of the United States) is related to President James Madison, Jr. (4th President of the United States) through their maternal grandmother, Frances Taylor who married Colonel James Madison, Sr.'s father, Ambrose. #7 Erasmus Taylor, (son of Col. James Taylor II), born September 5, 1715 in Orange Co., Virginia. Married Jane Moore. 1. Mildred Taylor, born December 18, 1751; married William Morton. Elizabeth Taylor, born September 22, 1755; married Andrew Glassell. Lucy Taylor, born December 13, 1757; married Rev. Alexander Balmain on October 31, 1786. John Taylor, born October 26, 1760; married Ann Gilbert. Robert Taylor, born April 29, 1763; married Frances Pendleton. Jane Taylor, born March 2, 1766; married Charles Pitt Howard. 4. Helen Buchan Glassell, born July 28, 1785 married Daniel Grinnan Jr. When Louisa died, John Glassell remarried. His 2nd wife was Margaret Christian (Scott) Lee. They added 2 more children to the family. Lucy Taylor Balmain was the sister of Elizabeth Taylor - the grandmother of Frances Toy Glassell (wife of Josiah WARE). Frances and Josiah WARE named one of their daughters Lucy Balmain WARE after the Reverend Balmain. 6. VIRGINIA GENEALOGIES: A Genealogy of the Glassell Family of Scotland and Virginia by Rev. Horace Edwin Hayden, M. A. Printed in Wilkes-Barre, Pennsylvania in 1891 – copyrighted 1885. CHILD #1 Frances Thompson Taylor, (daughter of Col. James Taylor II) born August 30, 1700, married Ambrose Madison. One of her brothers was Zachary Taylor, born April 17, 1707, who married Elizabeth Lee. Another brother was Erasmus Taylor, born September 5, 1715, who married Jane Moore. They had a son named James Madison, born March 27, 1723, who married Eleanor Rose Conway. 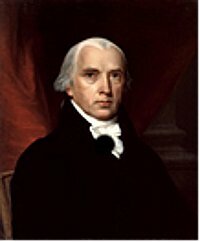 They had a son named James Madison Jr., born March 16, 1751, who became President of the United States. He married Dorothy (Dolley) Payne Todd Madison (May 20, 1768 – July 12, 1849) daughter of John Payne and Mary Coles, September 15, 1794 in Jefferson Co., Virginia. President James Madison and Dolley did not have any children of their own. CHILD #2 Zachary Taylor, born April 17, 1707, married Elizabeth Lee. They had a son named Richard Taylor, born April 12, 1741, who married Sarah Dabney Strother. Col. Richard Taylor and Sarah had a son named Zachary Taylor, born November 24, 1784, who became President of the United States. He married Margaret Smith. President Zachary Taylor and Margaret had a daughter named Sarah Knox Taylor who married Jefferson Davis. President Taylor did not approve of the match, so the couple eloped and married on June 17, 1835. While visiting Davis family in Louisiana, Sarah died of malaria just 3 months after the wedding. Jefferson Davis spent the next 8 years as a recluse until 1845 when he married Varina Howell. Child #3 Erasmus Taylor, born September 5, 1715, married Jane Moore. Erasmus and Jane had a daughter named Elizabeth Taylor, born September 22, 1755, who married Andrew Glassell. She was the sister of Lucy Taylor, who was born December 13, 1757 and married Rev. Alexander Balmain on October 31, 1786. Erasmus Taylor was the father of both girls so both Elizabeth Taylor Glassell AND Lucy Taylor Balmain were cousins with President James Madison. ** note the references below confirming the “cousin” status between the Taylor sisters and President Madison. “Fannie Glassell was sent to school in Winchester and stayed at the Episcopal Rectory with Rev. Alexander Balmain who had married Fannie’s aunt, a Miss Lucy Taylor of Culpepper, in Orange.” Lucy was the sister of Elizabeth Taylor mentioned below and Fannie Glassell married Josiah Ware. Elizabeth Taylor married Andrew Glassell and they had John Glassell, born October 29, 1780, who married Louisa Richard Brown. John and Louisa had Frances Toy Glassell who married Josiah William Ware – thus bringing in the WARE connection. The Ware children of Josiah and Frances were therefore distant cousins to both President Zachary Taylor and President James Madison as well. grandparents - Andrew and Elizabeth Taylor Glassell & her great aunt was Lucy Taylor Balmain. Ambrose and Frances Thompson Taylor Madison were sibling and in-laws with Zachary and Elizabeth Lee Taylor and also Erasmus and Jane Moore Taylor. The Madison’s son, James Madison would have been 1st cousins with Colonel Richard Taylor and Elizabeth Taylor Glassell. 1. Mildred Glassell, born June 21, 1778 married Rueben Smith who had George A. Smith who married Julia Somerville. Their daughter, Jane Morton Smith, married James Alexander Ware, son of Josiah William Ware and Frances Glassell Ware.